The National Disability Insurance Scheme (NDIS) is now rolling out across Australia, until 2019. No matter when the NDIS is coming to you it is worth being prepared. Download our getting ready for the NDIS guide to make sure you make the most of the NDIS. The first stages of the National Disability Insurance Scheme (NDIS) in Victoria began in a trial site in the Barwon region on 1 July 2013. The NDIS started rolling out in Yarra, Banyule, Darebin, Nillumbik and Whittlesea from 1 July 2016. The NDIS started rolling out in Ararat, Ballarat, Golden Plains, Hepburn, Moorabool, Pyrenees from 1 January 2017. The NDIS started rolling out in Campaspe, Central Goldfields, Greater Bendigo, Loddon, Macedon Ranges, Mount Alexander from 1 May 2017. Will I be notified when the NDIS comes to my area? When the NDIS comes to your area, if you are currently receiving disability supports, it is likely that you will be contacted by the NDIS to start working on your plan. You can find out more about whether you are eligible for the NDIS and if so when you can access it. If you don’t currently receive funding, then you will need to be assessed for eligibility to access the NDIS. What will happen before the NDIS comes to my area? If your area isn’t able to access the NDIS yet, it will be ‘business as usual’ for the disability supports you receive. It’s a good idea to start understanding and thinking about the NDIS early so you can make the most of the opportunity when it’s available to you. 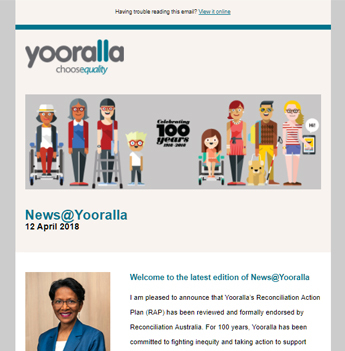 Yooralla has resources to help you understand the NDIS and get prepared before it comes to your area. Download our free guide to prepare for the NDIS.